Bremach Industry Company in 1956s in the city of Varese in northern Italy. It originated from the merger of two smaller manufacturers; 3-wheeled trucks and truck Fratelli Brenna scooters manufacturer Aermacchi, the names of which was formed by the combination of Bremach, BREnna and MAcCHi. From one project Aeronautica Macchi, the company is still very much in demand on the military market, the idea of creating three-wheeled cargo vehicle designed for transport over short distances with economical performance and absolute reliability. In the 70 years. Bremach developed a project vehicle with four driving wheels [source not specified 670 days] . The first time is available in 6 models Bremach popular in Italy 3-wheeled trucks: Motocarro, GR, NGR. In the 1980s. This scale was reduced to a 1.5-tonner ND3R. Since 1983, the company began production of its most famous car series GR ( 4x4 ). It includes a unified multi-purpose all-wheel drive car bonnet GR35 and GR45 full weight of 3.5-4.5 with a four-cylinder 2.5-liter diesel engine IVECO ( IVECO ) 75 hp (With turbo charging - 103 HP) [citation needed 670 days] . In 1993, the issue was launched low-frame chassis BRIO (Brio) 4x2 with engine 75 hp for municipal services. Overall height (1820 mm) allows their use in low confined areas. By 2000, business firms Bremach Industry went bad, and it was decided to merge with companies Pro. DE and VALSELLA MECCANOTECNICA. From 2001 to 2002, offers a new all-wheel drive Bremach family Extreme (Extreme). Technically, the new machines Bremach Brick and Extreme (4x4) do not differ from the previous series of GR. 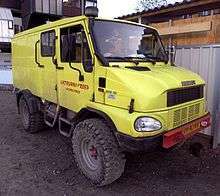 They are still equipped with the 2.8-liter diesel engine IVECO 8140.43 with direct fuel injection and turbocharging, developing 105 hp and to comply with Euro-3 . In 2005 the company became part of the Fiat Group . Bremach staff has been completely updated for young and energetic engineers, designers and managers [citation needed 670 days] . Since 2006 Bremach offers a completely redesigned range of cars Brick, Extreme and Job with updated cabins, having a streamlined front fascia with round plastic hood and distinctive drop-shaped glass headlights. Technically Bremach Brick and Extreme (4x4) is not much different from the previous series of GR. 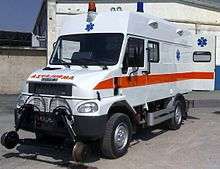 The main difference between highway "hard workers" from their counterparts - the possibility of a complete set air suspension and 146-horsepower turbodiesel allowing laden car to reach speeds up to 125 km / h. These chassis have chosen the company, the creators of technology for the police and other law enforcement agencies, as well as ambulances [source not specified 670 days] . Since 2008 he has presented a new Bremach T-REX, which replaced the old lineup. Its peculiarity transmission consisting of a base mechanical six-speed ZF transmission with a two-stage transfer case, providing up to 24 forward gears and four back. Suspension of the machine consists of a beam axle on the springs, and the new cab T-REX is the main feature of the previous models, it has a completely new design, improved visibility and heavy-duty space frame, which had previously only been used in aircraft and race cars of Formula 1 [citation Set 670 days] . In 2009 Bremach Industry in conjunction with the Ulyanovsk Automobile Plant start development of a new special truck chassis-based Bremach - UAZ T-REX. It was assumed that the cars UAZ T-REX terrain capacity of up to 3.5 tonnes will be made under the orders of end customers for the needs of the road construction sector, government agencies, as well as special vehicles for the emergency operation at processing facilities in remote regions. As far as is known from reliable sources, this project has not received further development. In 2011, Bremach once again forced to talk about himself, releasing demokar electric Bremach T-REX EV. Frame cabin - this is a unique structure, the first in the world it is made in the form of "adaptive spatial framework", which is strengthened high-strength steel, capable of withstanding a load of 5 + 1 G . The heart of the T-REX is the innovative structure - roll bar unprecedented strength, which avoids any cracks and deformations, even in the case of very heavy loads. In Germany, the cars were subject to a heavy military tests (virtual and real), and they were assigned the necessary certificates for art through KMW . Small size and high load capacity electric Bremach T-REX revolutionized the field of special transport at the international level. Specially made for this project Bremach used today only in the areas of aerospace and aviation. Bremach T-REX is considered a multi-purpose truck, it can also be used on a "citizen" for utilitarian purposes - hunting, fishing, traveling, etc. Currently, manufacturers can offer a little car with such a combination of off-road capabilities and comfort, and in this weight category (up to 3.5 tonnes, category "B" ) in Bremach there are no competitors. In terms of comfort in the car provided: cruise control, air conditioning, power windows, adjustable seats with cushioned swap, central locking with remote control and so forth. Open (SPIDER) for 2 seats. Single (SINGOLA) - 2-3 single place. Dual (DOPPIA) - double for 5-6 places. Wikimedia Commons has media related to Bremach. ↑ "Archived copy". Archived from the original on 2014-08-12. Retrieved 2014-08-11.